Don’t judge a book by it’s cover. Is this really true? Cover art, for better or for worse, is an integral part of a book. Among book lovers, cover art can be an awkward topic. Sometimes we tell ourselves the cover shouldn’t matter, only the story. Then a beautiful new edition of our favorite book is released and we fall in love all over again. We tell others never to judge a book by its cover, then we go out and buy a beautiful new hardcover just based on the art. Covers are important. We know this. And it’s time to start paying more attention to the cover. There are bad book covers and there are good book covers. All readers can probably think of a time they were seduced by a beautiful cover to read a disappointing book. Growing up in the 90s, I was attracted to books with a certain look. 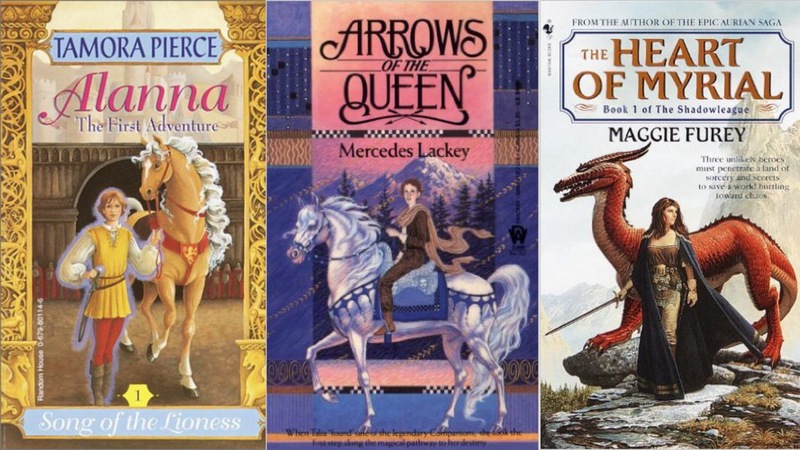 I adored Tamora Pierce’s Song of the Lioness series and picked up Mercedes Lackey, Maggie Furey, and others just because their cover art signaled me it would be my kind of fantasy book. Placed together, you can spot a certain similarity. When I was younger, this was a great way to find the books I was interested in. It isn’t just me— cover art can be a signal to readers about what kind of book they are reading. Books by Michael Crichton, Clive Cussler, and Tom Clancy share a certain aesthetic and may appeal to a similar group of readers. When a book becomes popular, the art style may be emulated across the board. Young Adult novels are particularly susceptible to trends. If it helps readers to find the books they want, cover art is doing it’s job. In this case, judging a book by it’s cover has a positive outcome. At a recent event, A Natural History of Dragons author Marie Brennan said she knew how “lucky” she had gotten with her cover art. Every book in the series is a beautiful work of art, but I’ll always be partial to the first one. Indeed, it was the beautiful cover on the first book in the Lady Trent series that first caught my attention. The series, which currently has four books, is now one of the most beautiful sets of books I own. I love the story, but I’m not sure if I would have ever picked them up if it hadn’t been for the cover. I’m not going to feel guilty about that. There may be books out there that I unfairly pass over because of a terrible cover, but when I discover so many wonderful books because of their cover, how can I feel sad? There are more books in the world than I’ll ever have time to read anyway. A common cover art problem is when a reader assumes something from the cover and finds out the book is something completely different. Although this can be disappointing, sometimes it’s a great way to find something you wouldn’t otherwise read. Two years ago, I was browsing the new book shelf at my library, when I spotted a beautiful cover on a book called The Enchanted. With an impatient husband telling me it was time to leave, I checked it out without reading the description. Although I misinterpreted this book, the beautiful cover art of The Enchanted is a perfect match after reading it. At first glance, with its golden horses prancing across the cover, it could have been fantasy. It turned out to be an achingly poignant novel about inmates on death row— beautiful and sad. It profoundly affected me and I didn’t pick up another book for days. In this case, I’m so glad I misinterpreted the art. Among science fiction aficionados, there also remains a strange affection for those truly terrible and cheesy covers, with lurid aliens and muscly men pointing ray guns. Since sci-fi grew out of the pulp novels, cheaply produced paperbacks and magazines, these ridiculous covers evoke a sense of amusement and nostalgia. In fact, a mini-challenge hosted by Outlandish Lit during the recent 24-hour readathon challenged participants to finds the weirdest book covers on their shelves. Hands down, the best were always sci-fi novels. Heinlein is a legendary science fiction author, but this cover is ridiculous. Is that alien playing an accordion? I pulled this one off my shelf for the #WeirdCoverHunt readathon mini-challenge. If you want that aesthetic in new genre books, Baen is the one publisher where I can spot their books a mile away, just based on the art. I admit it. I like these bizarre covers, and take delight in spotting them on the shelves of bookstores, knowing the tacky cover may reveal a gem. Every book lover knows a house just isn’t complete without books. And beautiful books can be a focal point in the same way a piece of art can. I love decorating with books. I showed my love of the art of A natural History of Dragons with a themed display. Below, Flight of the Silver Ship gets a similar treatment. And we have more than just the cover art to consider as the art of a book goes well beyond just it’s cover. Typography, chapter headings, end papers all contribute to a book’s beauty. Myself, I’m a fan of deckled edges. The adage reminds us not to judge a book by it’s cover, but the visual is a key element. As much as we would like to say that only the words matter, the art of the book is an important part of how the story is presented to a reader. Great examples! 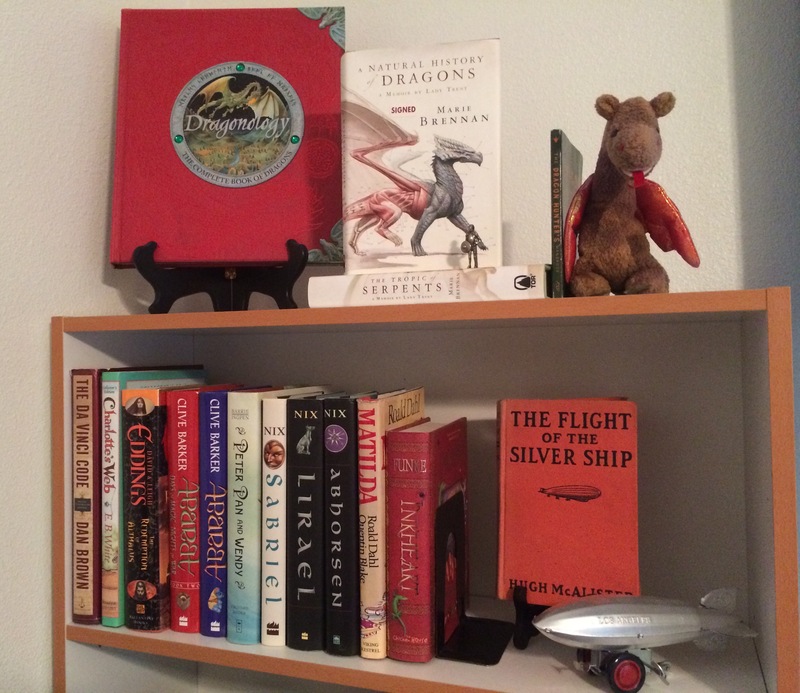 And I love your bookshelf with the matching dragon and airship. That is so cute! This is SUCH an interesting topic! I basically want to co-sign everything you said. I picked up ‘A Natural History of Dragons’ recently precisely because the cover art was so appealing (dragons + science? yes please). I’ve found that SF/F cover art tends to be either *really* good or *really* bad with little in between, except occasionally art that’s so bonkers it goes right through “bad” and right back around to “so bad it’s good” instead. Sure, we’re not supposed to judge books by their covers, but we’re not supposed to judge other people by their appearances either and we still DO because we’re human and that’s how human brains work! A book cover is like clothing for a person — it can signal at one look a set of values/qualities, accurately or not, that will tell the viewer a lot about the contents. That person is wearing red lipstick? Must be confident & outgoing! That book has dragons on? MY KINDA BOOK. & so forth.